HOST: It must have been a very traumatic ordeal for you. Can you tell us about it. HOST: Do you need a moment to compose yourself? GRACE: No, I'm fine. (Deep breath) It was 1874. My family had moved around a lot because my father, bless his departed soul, was a restless man. It was hard for a girl my age to make friends, not living in one place for very long, and just when Ma, Kevin and I thought we might settle down, General George Armstrong Custer made an announcement about gold being discovered in the Black Hills of Lakota territory. That's all it took! Pa loaded everything back into our Conestoga and insisted this was his chance to strike it big. HOST: Why didn't you mother put her foot down? GRACE: You have to understand that back then, women were expected to know their place. Ma pretty much did as Pa said. Besides, he promised her that when he hit the mother lode, he would buy us a new house; new furniture and we'd never have to move again. HOST: I can see how that might have sounded pretty enticing. GRACE: It was. We all had visions of putting down permanent roots, so being out on the plains, cooking over a campfire again and roughing it for a just a little longer was worth it if Pa and my brother, Kevin, found gold. HOST: Tell us more about your experience, please. GRACE: Okay. We had made camp at the base of the Black Hills, near a sparse stand of trees. There was a small stream nearby, so water was plentiful. Ma and I slept on a pallet of blankets in the wagon, while Pa and Kev slept in a makeshift tent. We had just finished breakfast one morning and were laughing and talking before Pa and Kev went off to the mine, when I happened to spy some riders on the horizon. It soon became clear from the whooping and hollering that they were being attacked by Indians. HOST: Oh my goodness, what did you do? GRACE: Pa immediately yelled for Ma and I to get back in the Conestoga, and he and Kev grabbed their rifles and crawled underneath. I hunkered down behind the tailgate, waiting for Ma, but she never came. I was so scared, hearing the sound of gunfire and those blood-curdling war cries, I covered my ears, but it didn't help. When I got the courage to peek outside, I saw the Indians circling our wagon and Ma running in the opposite direction. I think she was trying to draw them away from me. I didn't realize it at the time, but Pa and Kevin were already dead. They were easy pickings with no real shelter. GRACE: You have no idea! (Stopping to bite her knuckle, then staring straight ahead). They…they shot my ma down in cold blood right before my eyes. HOST: Oh you poor thing. What did you do then? GRACE: (Dabbing at eyes with hanky) I curled myself into a ball and prayed that it was all just a bad dream, and that I'd wake up. When I didn't hear anything for a while, I found the courage to rise to my knees and peer over the tailgate again. I almost had heart failure when I came face-to-face with the ugliest sight I'd ever seen. HOST: Oh my gosh, I have goose bumps. What was it? HOST: Lord, what was going through your head? GRACE: I was certain he was going to kill me, too. I think he might have had it not been for one of his friends. The one, called Little Elk, seemed to step in and calm Black Crow down. Still, it was an awful thing to go through, wondering if you were going to live or die. After Black Crow tethered my arms together and dragged me along behind his horse, like I was nothing more than an animal, I almost wished I had died. I fought to keep up all the way to the Indian village. HOST: How far was it? GRACE: (Holding out her wrists). I'm not sure, but you can still see the scars where the rawhide bit into my skin. I didn't have time to get my shoes on, so my feet were pretty raw, too. I'm used to walking beside the wagon every day, but being dragged is quite different. It took forever. HOST: What happened when you got to the village? GRACE: I was so tired I could barely stand, but I dared not drop to the ground when it seemed like the whole village stood in a circle around me, staring and laughing. I thought for sure I was about to meet my maker, but something very surprising happened. HOST: Oh gosh, we're almost out of time and I hate to make you stop. Can you give us a brief summary, and quickly? HOST: Is this for me? How nice, and it's autographed. Grace Cummings, thank you so much for spending time with us and sharing your captivating story. 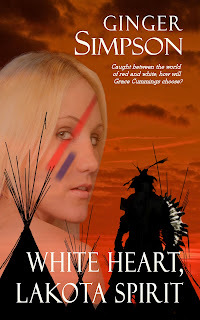 I'd like to remind our readers that White Heart, Lakota Spirit by Ginger Simpson is offered at http://www.eternalpress.biz and on Amazon, available in both print and download. There's more to story, and if you're like me, you want to know how things turned out. Happy reading! Back in the olden days, urine was used to tan animal skins, so families all peed in a pot. Once the container was full, the urine was taken and sold to the tannery... if you had to do this to survive you were "Piss Poor". But worse than that were the really poor folk who couldn't even afford to buy a pot...they "didn't have a pot to piss in" and were the lowest of the low. Most people got married in June because they took their yearly bath in May, and they still smelled pretty good. However, since they were starting to smell, brides carried a bouquet of flowers to hide the body odor. Hence the custom today of carrying a bouquet when getting married. Baths consisted of a big tub filled with hot water. The man of the house had the privilege of the nice clean water, then all the other sons and men, then the women and finally the children. Last of all the babies. By then the water was so dirty you could actually lose someone in it, hence the saying, "Don't throw the baby out with the bath water!" Houses had thatched roofs-thick straw-piled high, with no wood underneath. It was the only place for animals to get warm, so all the cats and other small animals (mice, bugs) lived in the roof. When it rained the roof became slippery and the animals often slipped and fell off the roof. Hence the saying, "It's raining cats and dogs." Because of thatched roofs, all kinds of things fell into the house. This posed a real problem in the bedroom where bugs and other droppings messed up your nice clean bed. Hence, a bed with big posts and a sheet hung over the top afforded some protection. That's how canopy beds came into existence. Inside, floors were usually dirt unless you were rich, hence the saying, "Dirt poor." The slate floors of the wealthy got slippery in winter, so they used thresh to help keep their footing. As the wet weather wore on, more thresh was added, so when you opened the door, the straw slipped outside. A piece of wood, placed across the entrance-way held the thresh in place. Hence: a thresh hold. “Peas porridge hot, peas porridge cold, peas porridge in the pot nine days old”. Sometimes they could obtain pork, which made them feel quite special. When visitors came over, they would hang up their bacon to show off. It was a sign of wealth that a man could, "bring home the bacon." They would cut off a little to share with guests And would all sit around and chew the fat. Lead cups were used to drink ale or whisky. The combination would sometimes knock the imbibers out for a couple of days. Someone walking along the road would take them for dead and prepare them for burial. They were laid out on the kitchen table for a couple of days and the family would gather around and eat and drink and wait and see if they would wake up. Hence the custom; “of holding a wake”. England is old and small and the local folks started running out of places to bury people. So they would dig up coffins and would take the bones to a bone-house, and reuse the grave. When reopening these coffins, 1 out of 25 coffins were found to have scratch marks on the inside and they realized they had been burying people alive. So they would tie a string on the wrist of the corpse, lead it through the coffin and up through the ground and tie it to a bell. Someone would have to sit out in the graveyard all night (the graveyard shift.) to listen for the bell; thus, someone could be, “saved by the bell” or was "considered a dead ringer”. Yep, Double Crossing also has a mystery element and a touch of inspirational. I call it a “blended genre” read – check out my 5-star reviews on Amazon and Goodreads! Why did you set Double Crossing on the transcontinental railroad? Did you learn anything about trains that surprised you while writing this book? I loved True Grit (the original book, the movie in 1969 and the recent version also) and was inspired to use the “premise” of a young woman whose father is murdered, setting her on a quest for justice. Because I had to “twist” it (in many ways, since I couldn’t use Rooster Cogburn either! ), I chose the transcontinental railroad because I’d always been fascinated by trains. Since the UP and CP first came together at Promontory Point in May of 1869, I decided that setting Double Crossing several months after that historic event seemed a ‘natural fit.’ And the research all seemed to fall into place, with a book written in 1872 about an English nobleman taking a train trip from New York to San Francisco, plus other interesting sources. The most surprising thing I learned while writing this book – most people assume trains had normal “washroom” facilities like modern trains. Think again! Basically they were ‘outhouse’ holes with waste falling to the track, and caused major hygienic problems over the years. If your great-grandparents or grandparents were told to stay away from playing on the tracks until the 1930s, when plumbing was introduced to passenger cars, there was a good reason for that! Imagine how cold that would be in winter, too. Since you mentioned Rooster Cogburn, did you create a character with the same role? That was also tough – I rolled Rooster and the Texas Ranger LaBoef into “ Ace” Diamond, an ex-Confederate cavalry soldier, poker-player and wanderer… how did he end up in Omaha, Nebraska, without his horse? I’m considering writing a brief “prequel” short story to explain that soon! He may not be one-eyed or a drunk, but he has an interesting history nonetheless. Tell us about Lily Granville. How did she introduce herself to you? Lily went through many transitions. First she was as young as Mattie Ross, 14 years old and so whiny and spoiled, I disliked her. So I stuffed ‘Linnet,’ kicking and screaming, back into the centrifuge. Out popped Julia, who was 17, religious and quite bent on revenge for her father’s murder. Enough to shoot the killer, in fact, which wouldn’t work – she needed to be vulnerable. Needy. Yet spunky enough to undertake a 2,000 mile adventure and seek justice, not revenge. ‘Julia’ morphed into Lily, who loved her father yet quarreled with him – and then overcame her heartbreak to track the man she believed responsible for his death. Lily, at 19, has many choices ahead of her and discovers her own resilience is much stronger than she ever knew in Double Crossing. She’ll need that for the next adventure in Double or Nothing! I ignored a twinge of guilt while the fib hovered between us. Her mouth pinched tight, she drummed her fingers on the tablecloth. Charles stood quiet, his face beet red, one hand smoothing back his fair hair, the other adjusting his collar and tie. Angry yells and shouts drifted through the window panes from the street, drowning out the resumed conversation around us, the clatter of plates and flatware. Outside, I caught sight of several men who fought with bare fists. They kicked, bit, scratched and pummeled each other. Sir Vaughn glanced out the window and then sat across from my aunt. He waved a hand. A blood‑curdling yell, similar to what I’d read about an Indian war cry, stopped her cold. The moment I glanced up, the window exploded. Shards of glass rained on us and a man rolled over the table. Scattering plates, flatware, cups and teapot, before he crashed onto the floor—unconscious, and half‑draped in the tablecloth among the broken china and glass. Mere inches from my feet. Check out the reviews on Amazon and Goodreads! Although I tried to find some history of what this day might have been like in the old west, I could only find the history of Valentine's Day as it came to be. Seems back in the triple digit years A.D., some priest guy named Valentine was executed for defying the then Ruler by continuing to perform marriages despite a decree that single men made better soldiers. Later on down the road he was granted Sainthood and this day became synonymous with love and romance. Now, don't get me wrong...I love mushy cards and flowers as much as the next gal, and once the chocolate industry got involved, this immediately became one of my favorite holidays, but I can't help but wonder what this day would have been like back in the old west, say...out on the Rockin C Ranch, miles from a mercantile and long before boxed chocolates and fresh flower delivery were available. Let's imagine together, shall we: Note: For the sake of saving brain cells, I'm going to use Frank and Mariah from my time-travel, Sisters in Time as the characters, since they lived on the Rocking C in old Denver territory. Bacon sizzled and spit grease onto the cast iron stove. Mariah took a step back to avoid the splatter. The smell of baking biscuits wafted in the air. All that was needed for a special breakfast she'd share with just her handsome husband were eggs and she was about to break them into the pan. The children were spending a week with their grandparents, and fresh coffee perked on the back burner. She wore her best gingham, and had foregone pulling her hair into it's usual bun and left it down around her shoulders--Frank's favorite look for her. Although not practical for chores, today would be about him. Frank curried his stallion while it munched oats from the feedbag. All his other chores were done, and the boys from the bunkhouse were already out on the south forty, moving the cattle to the north pasture. 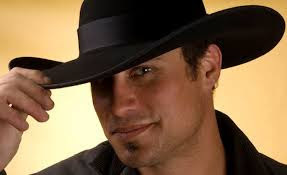 Earlier, he'd washed up, put on a clean shirt, and dusted off his black Stetson. Storm finished his meal, and Frank's stomach rumbled in anticipation of his own. He removed the bag from the animal's head, stowed it and the curry comb on the back wall, and gave his black beauty a pat on his hind quarter as he left the stall. Outside the barn, he breathed in the fresh air. The aroma of alfalfa mingled with the smell of cooking bacon drifting from the open kitchen window. He caught the occasional strains of a song his wife hummed, and his heart quickened with love for her. He crossed to the water barrel at the corner of the house and washed his hands. The back porch screen squealed open. "Frank, breakfast is ready." He glanced in Mariah's direction. Her red hair hung loose around her still smooth and beautiful face. Her trim waist and curvy figure belied the birth of two children nearly grown. He was indeed a lucky man. "Be right there," he called back. She stepped back into the kitchen. Okay, that's it for my creative talents on this special day. The point is that even without today's conveniences, I'm sure something as simple as Mariah leaving her hair down and Frank pausing to pick a few posies would mean something to their mate. Even if you don't have money or means...show someone you love them today...in a special way. Happy Valentine's Day, everyone. Captured by a Lakota war party, her family slaughtered before her very eyes, Grace must eventually decide where she truly belongs. Green Eyes stood outside her lodge and spread three large rabbit pelts across her drying rack. A commotion caught her attention, and she crossed the compound to where a crowd gathered. She stood on tiptoes, looking over shoulders to see what caused the excitement. Little Elk stepped aside, and the reason for the fervor became evident. Black Crow towered over a terrified young white girl who looked to be around sixteen. Her sobbing had no affect on him, and with eyes wide with fright, she cowered in the dirt at her captor’s feet. “Black Crow captured her. She will be his prisoner.” The young brave standing before Green Eyes hardly compared to the twelve-year-old orphan left behind by Spotted Doe. His body was no longer that of a child, and his voice boomed with authority. Even as the words tumbled out of her mouth, she shivered in fear that she’d overstepped her boundaries. The young captive’s pitiful sobs tore at Green Eyes’ heart as Black Crow dragged her toward his mother’s lodge. Someone had to help the girl. Grace scanned the village and the seemingly hostile people surrounding her. Her heart pounded with fear. What would become of her? Her mind played flashbacks of her family sprawled on the ground. Not even a proper burial ... just left to the hungry animals roaming the plains. If only she could block the scene from her mind, but her heart ached for the loss of her family. She’d never see her mother’s lovely face or hear her father’s booming voice.... And her brother, Kevin, her protector and best friend. He died without even experiencing life. Oh, how she hated the brutal and heartless man who held her tether. Never before had she wished anyone dead, but if he dropped at her feet, she’d find the energy to dance with joy. Her mind spun in a million directions. What was her captor saying? Was he going to kill her? What had her family done to deserve such a brutal end? The sound of arguing intruded into her thoughts. She looked up and spied red braids. For a moment Grace’s thoughts turned to something other than her own pending death. Didn’t all Indians have dark hair? The woman’s locks shone like fire, but her sun-kissed skin made it difficult to tell if she was white. Could she be a captive, too? 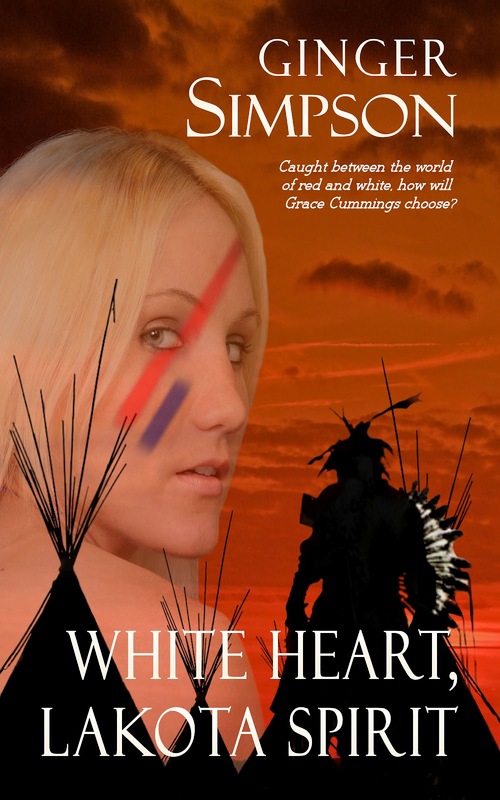 White Heart, Lakota Spirit is available for sale on Amazon, and through the publisher, Eternal Press, in both print and download. Sisters in Time is published by Eternal Press and available on Amazon and other places too numerous to mention. 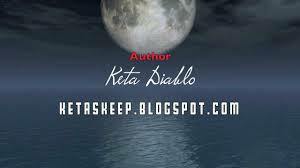 My latest releases, Holding On To Heaven and the sequel, Dark Night of the Moon are westerns! Let's hear it for the cowboys! Actually, the sequel is also a wolf shape shifter too, but don't worry, there's plenty of shoot 'em up in both novels. While writing Dark Night of the Moon, I did quite a bit of research on the wolf and the mythology surrounding him/her concerning their ability to shift into humans. Would you believe, shape shifters existed in Native American legend and lore long before they appeared in Twilight! You don't say? Here are some interesting facts I stumbled upon concerning shape shifting beasts, particularly wolves, when the Native American tribes ruled the plains. The wolf shifter in Dark Night of the Moon happens to be a gray wolf. The gray wolf (Canis lupus) is also known as the Arctic wolf, common wolf, Mexican wolf, Plains wolf, timber wolf, and Tundra wolf. At one time, they were the world's most widely distributed mammal, but they've become extinct now in much of Western Europe, Mexico and the US. Their packs have been reduced by almost one-third over the years because we've been led to believe they prey on livestock and humans. In actuality, it's very rare for humans to be attacked by a wolf. Native Americans have profound respect for the wolf. To several tribes the wolf was known as a protective spirit or totem. They viewed the wolf as a wise fellow hunter to be respected and admired. Those who could shift into the wolf were known as limmikin (or yenaloosi) in many tribes. The Navajo are best known for their shifter beliefs. They called men who could morph into wolves skinwalkers, or yennadlooshi which means "He goes on all fours." According to Navajo tradition skinwalkers look physically different from normal people – the main difference is their eyes—large and glowing, even in daylight. It’s believed if someone looks a skinwalker in the eyes, the creature can absorb a person and steal their skin. They could also read minds and lure people from their homes and into the woods by imitating the voices and cries of loved ones. Examples of the wolf appearing throughout Native American mythology include the following. * The Eskimos spoke of an old woman, Qisaruatsiaq, who was abandoned and forced to live by herself. Eventually, she turned into a wolf. * The Sioux called the wolf shunk manitu tanka, meaning animal that looks like a dog but is a powerful spirit. * Cheyenne medicine men rubbed warrior arrows against wolf fur to bring better luck in hunting. * The Nootka celebrated spiritual ties to the wolf. When someone died, they thought they could bring a person back to life by wearing wolf clothing. * The Cherokee would not kill a wolf, believing the dead wolf's siblings would exact revenge. They learned to walk like a wolf to ward off frostbite to their feet. * The Crow dressed in wolf skins to hunt. * The Mandan displayed wolf tails on their moccasins, signs of success in battle. * Women of the Hidatsa tribe rubbed their bellies with wolf skin to alleviate difficult childbirth. * The Cree believed divine wolves visited earth when the northern lights shone during winter. * The Ahtena would prop dead wolves up, sometimes feeding them ceremonial meals. * Chippewa myths tell of wolves supplying humans with food and hides. * The Delaware tribe thought a change in weather might be announced through a wolf's howl. A woman was hurt and left behind by her people. She ran out of food and nearly starved, but came upon a wolf den and crawled inside. At first the members of the pack were suspicious and afraid of her, but eventually they grew to like her. When they brought food to their pups they shared it with her. Eventually she was strong enough to snare rabbits and help with the hunting. She stayed with the pack for many years. One day the oldest wolf smelled humans coming, and strangely the woman did too. They were her own people and she realized she must return to them. She reunited herself with the village very slowly and brought with her the skills of the wolf. She knew wolf talk and developed a keen sense of smell, allowing her to predict bad weather far in advance. She could also alert the village when game or other humans came around. I hope I’ve piqued your interest. If you’d like to know more about Holding On To Heaven and Dark Night of the Moon, you can read the great reviews on Amazon. Want an opportunity to win a Kindle? I'm amazed at how many people don't leave a simple comment to be entered into a contest, but I guess everyone is inundated with giveaways since Kindle has tons of free books up every day. This is a perfect way to get the reader to load them on. Sunday: Chicken Dinner, all winners announced! I write western historical novels because I love that time period. The old west was raw, hard, and character building. To survive, the people had to have exemplary strength and determination. But, my fascination doesn’t end with the pioneers; I’ve always had an unexplained interest in the history of American Indians, so much so that I wonder if I lived a previous life as one. By writing about them, I can help alter the perception that TV westerns have fostered—that the red man was always the bad guy. In two previous novels, I focused on the customs and traditions of the Lakota Sioux. I tried to portray them as the proud people they were. Do readers realize that writing an historical novel is much more time consuming than say writing a contemporary or suspense? Although my stories are fictional, the facts to support history have to be accurate and true. The language has to fit the period as does the dress, and the gadgets available at the time. Back in the 1800s, which is the era of my choice, kids were goats, mothers were Ma, not Mom, and fathers were Pa, not Dad. The idea is not to overwhelm the reader with a history lesson, but pepper the story with facts that relate to the scenes and characters. In writing my first novel, I had my hero delivering his bride to in a shack in the middle of the prairie. I described her reaction to a rundown house, grass growing through the wooden shutters, a few pieces of splintered furniture. When I described the rooms, I also described a heavy iron stove. My editor was quick to point out that a deserted shack was more likely to have a fireplace and hearth where cooking was performed, and that the abode wasn’t likely to be more than one big room. Thank God, for editors who help us learn our craft. Now, when I write about a room, I put myself back in the time period and see through the hero or heroines eyes what should be there. If there is a question in my mind, I research the object and see exactly when it was invented. There’s no faster way to lose your credibility as an historical author than to yank your reader out of the story by having written about something that doesn’t fit the time. Imagine my Sarah, dressed in gingham, with her bonnet securely tied under her chin, coming in from the barn, carrying a pail of fresh milk. She sets the heavy container on the floor, and deciding to have some more coffee, pops a cup in the microwave to heat it. WAIT a minute. Something is wrong with this picture, and although I’ve used a very obvious discrepancy in time, you’d be surprised how quickly some historical readers are to pick up on even the slightest faux pas. Still, despite the extra time and effort required, historical writing is my preference. My heroine in Sarah’s Journey is the kind of person I strive to be. I want her survival strength, determination, and her ability to stand up to people when others are mistreated. I want to right the wrongs of humanity, and if only through becoming Sarah for a brief time, I can show my readers how badly people of half blood were treated and how hard life was in the old west. I can hold up my head, trudge along the Oregon Trail and wonder what looms over the next horizon. Sarah’s Journey is a historical fiction but more so a story about a woman’s struggle to find a new life, deal with disappointment, and handle the realization that she loves a man that no one in the world but her is ready to accept. I hope people enjoy reading it as much as I loved writing it. It doesn’t have a “traditional ending” but that’s all I’m going to say. You either GET it or you don't. I thoroughly enjoyed Ms. Simpson’s recreation of Western life. The word that kept coming to mind as I read this story was uncompromising. Little is omitted, whether it be gruesome wounds, the preparation of herbs and food, Sarah’s body language, or the precise terms for the different noises made by a horse. I loved seeing all this research come to life. The author’s passion for the period and particularly for her characters shone throughout. This was clearly a labour of love. The e-publishing uproar is great in so many respects...especially for those with new books to contract and have a say in the price. I've been writing for over ten years and have several books published through traditional e-publishers, and the concern for me is the pricing. I'm not as concerned with charges for print books since most of the focus is now on downloads...finally. There are, however, some old school folks who still want to hold a "real" book in their hands, but are they willing to pay the outlandish prices being asked? Besides, the price for me is prohibitive for anyone on a fixed income. I understand my publishers have to make a profit. They also have to pay the editor, copy editor, cover artist, and whatever other fees are incurred, then we split what's left, which sometimes is more a slap in the face than an honor. I find that making ten cents per print copy sold ($9.95-13.95) leaves a very bitter taste in my mouth. I make far more on downloads, but the majority of any money I make right now is on the two books with the least expensive price of $2.99. Those priced in the $5.95 neighborhood are going nowhere and there's nothing I can do but wait until my contract expires and hope someone is willing to accept previously published work. I see Amazon's KDP as a way of getting my brand of writing in the public eye...something I've been striving to do for years. I will, in the future, probably chose to self-publish and cut out the middleman, but that doesn't mean I don't recommend signing with a publisher. New authors who jump in feet first, self-publish, and then rue the fact that their editing stinks, are placing a stigma on the more-seasoned and trained authors who choose the route. This is a stigma those of us who started in the e-industry have faced all along. Signing with a traditional house who takes pride in what they turn out has been a valuable experience for me. I thought I'd written a prize-winning novel with my debut book, but it turned out to be nothing more than a delightful story I'd TOLD. I didn't SHOW my reader the emotions, smells, and other senses involved in a true novel. I head-hopped, used passive voice, made rookie mistakes that I've since learned to avoid. I wouldn't have learned any of this without my editor, and thankfully, I learned before the manuscript was published. I earned a four-star review on that novel from Romantic Times, which at that period, was being especially tough on e-authors. That one review will always remain a "gem" in my crown. Don't get me wrong....I don't believe any of my books are error-free, and I'm constantly learning. I do that now through critique groups with other experienced authors who have learned similar but often different lessons through their own editing sessions. I'm still very much involved with and part of my author's groups, but I'm seeing a swing in the trend which lures and confuses me at the same time. I wonder where all this is leading. B&N has already announced they are removing Amazon titles from their stores because of the exclusivity involved..."Barnes & Noble won’t sell books from Amazon’s new print publisher in its brick-and-mortar stores, in an attempt to cut off access for the online books behemoth that it says “undermined the industry” by signing exclusive agreements with publishers, agents, and authors," and lots of other book stores have already closed. I wanted an e-book revolution, but it it's going to turn out to be a bloody battle like the Civil War, then maybe I've been wishing for the wrong thing. You?